One question that kept running through my mind as I was re-reading The Scarlet Letter, by Nathaniel Hawthorne, was this one: Can young people in 21st-century American culture understand the feelings of the main characters in this story? It isn’t only laws and social standards that have changed, but, because of those changes, the way people feel about their own actions seems very, very different. At least, this is true on the surface, but I seriously wonder if “old-fashioned” feelings guilt and shame are really gone from postmodern consciousness. For example, there was a relatively recent radio phenomenon (I don’t know if she is still on the air or not), a call-in program hosted by “Dr. Laura.” Whenever I heard this program, I was amazed at the host’s punitive, harsh, scolding manner and the callers’ wishy-washy acceptance of her judgment against them. They seemed to be calling in for advice and help, what they got instead was a verbal bashing, and yet more and more people, who had heard these same conversations, kept calling in to be bashed! I couldn’t understand it, and not understanding frustrated me. Finally I came up with a hypothesis: The callers were not calling for advice at all. They were calling because they knew they’d done something bad, and they wanted to be punished! “Dr. Laura” gave them what they felt they deserved, which was what they wanted. (Would they “go and sin no more”? Had they received any insight from the scolding? That’s another thing I would dearly like to know.) My hunch is that people in our time still feel bad engaging in infidelity and many lesser wrongs (gossip, for instance), despite a culture that treats these matters as elements of comedy. We know from the story how Hester Prynne and Reverend Dimmesdale and Roger Chillingworth judge themselves and each other: Each one of them sees that all three bear a burden of guilt, although only Roger is motivated by revenge, judging himself the most sinned against. What I can’t decide for sure is how the author judged the three. It’s pretty clear he had little sympathy for Chillingworth. (Did Hawthorne turn C. into a demon, or did C. turn himself into one? Both?) Dimmesdale seemed to suffer the most, and Hawthorne also seemed most sympathetic to him. But how did Hawthorne judge Hester? Did he? Should authors judge their characters? We moderns tend to think not, but earlier generations had a different sensibility. I see Hawthorne’s admiration for Hester’s strength of character, as well as for her beauty (in fact, she is the strongest of the three), and yet she seems to make the author a bit nervous, too. Her heart, after all, is never chastened, never tamed. She acknowledges and accepts the public judgment against her but never fully internalizes it. If Chillingworth had not thrown a monkey wrench into the works, Hester would have carried the minister back to the Old World to be happy. Would he have been happy? Would she? They would still have had to live a lie of some kind, if Dimmesdale were to have any position of public honor. Wouldn’t his heart have continued to ache at the hypocrisy of his life, the difference between what people saw in him and what he knew about himself? Frail and weak as he was, physically and in character, I can easily imagine Hester being forced into being more mother and nurse to him than lover. It occurred to me as I was writing the last paragraph and went back to read the “Dr. Laura” part that Hester’s strength may come—and Hawthorne is pointing this out to us clearly; I was simply slow to see it—at least in part from the fact that she lived truthfully in her world and received her punishment from that world, while Chillingworth admitted his guilt only to Hester, hiding it from the world, and Dimmesdale declared his guilt publicly only in the last moments of his life. For both the men, then, you might say it was their hidden guilt and private suffering that ultimately destroyed them. Postmodern psychology has primarily concerned itself with ridding us of guilt and shame. Where such feelings are inappropriate, throwing them off has got to be a good thing. But when, for instance, Sartre complained that someone who saw him peering through a keyhole was “objectifying” him, turning him into a thing rather than seeing him as a person, was not the truth more that he was rightly embarrassed to be seen doing something shameful? 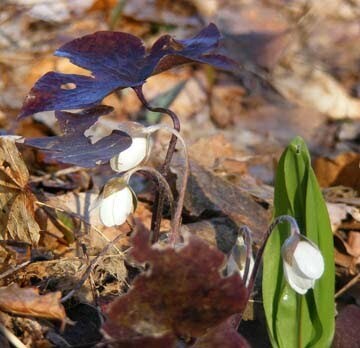 Everyone in and around Northport watches the spot along the highway south of town where a large colony of bloodroot (Sanguinaria canadensis, a member of the poppy family) blooms in early spring, but how did one lone plant come to be in the woods near my home, where I’ve never seen bloodroot before? Did it hitchhike in the body of a deer? I went back on Easter morning to check on my new neighbor again. The flowers weren’t any closer to opening, but this time I had my camera with me, so you can see my other blog for more photos of the little darling. 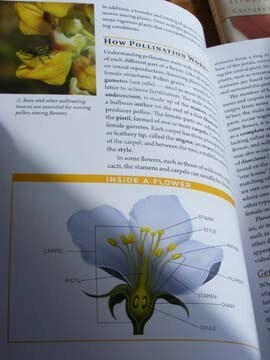 But thanks to Gerry Sell at Torch Lake Views for setting me straight: this is not bloodroot! At Gerry's nudge, I checked out another possibility, and she was right, I was wrong. Usually many individual flowers per plant, each with many thread-like stamens in its center, and each borne single on a hairy flowerstalk; 3 hairy bracts that resemble sepals below each blossom. 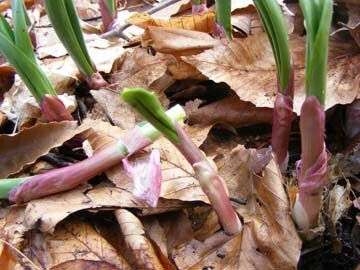 Leaves are smooth with 3 rounded lobes; leaves persist through winter. At blossom time these overwintered leaves are present and have a brown-purple color. New leaves develop after blossom time. Round-leafed hepatica, or liverwort, Hepatica americana, is a member of the crowfoot family, Ranunculaceae. 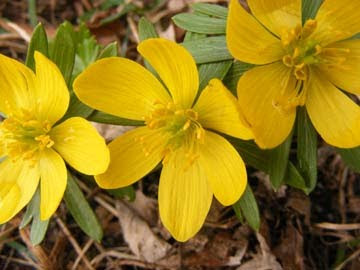 The cowslip, or marsh marigold, is also in this family, and we should start looking for it in boggy places and along streams before too long. All of us in temperate climates find our thoughts in spring turning to the birds and the bees—and the butterflies, too--and this season I'm happy to have at Dog Ears Books a new title to inspire and excite and energize us all for the work ahead. This book emphasizes what you as an individual can do to protect and strengthen pollinator populations by guiding you through the steps necessary to manage or enhance pollinator habitat in your backyard, farm, school campus, or natural area. However, to protect pollinators for the long term it’s important to consider these species and their ecological role in a larger context, and to enact policies that protect them on a local, national, and international level. We stand at a crossroad. Honey beekeepers lose unprecedented numbers of their honey bee colonies each year. Once-common bumble bees are disappearing across North America and Europe. Heavily developed agricultural and urban landscapes lack the habitat to support a diversity and abundance of bees, butterflies, and other pollinators. Another bad news story? 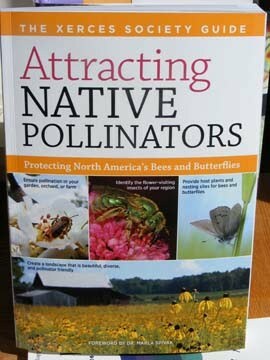 No, the good news is that when it comes to pollinators and habitats to support them, you can do something, and this book tells you how. 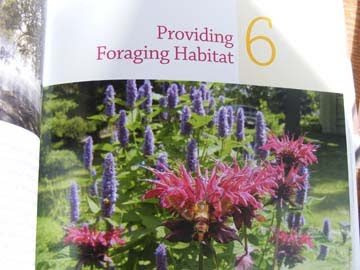 Your beautiful and entertaining butterfly garden will double as a bee garden, providing habitat for insects that do critical work to feed all of us. 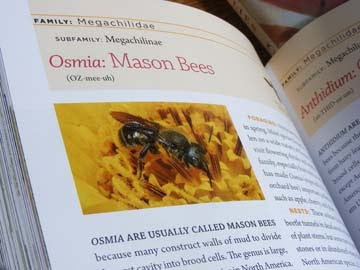 Presenting material clearly, with lavish color illustrations, this informative book is full of delights and surprises. It is true as a matter of state law that the State of Michigan, if it chose to do so, could eliminate local government jurisdictions and govern them directly … The State has the power to create cities, townships, villages and counties, and it can legally eliminate them as well. Wow. That is the guy on our side? Follow that link above to read the entire article and both sides of the question. Lately I’ve been dipping once again into Alexis de Toqueville’s Democracy in America. Yes, yes, I know—before you can object, I acknowledge that this book was written by a very young Frenchman and not by an American citizen, let alone an American lawyer, judge or historian. Some of de Toqueville’s opinions have been challenged in the years since his 1831 visit to the United States, but there is no other survey of American life and politics from that period, the more objective for having been written by an outsider, that covers as much ground from as many different perspectives as de Toqueville’s account. A dinner party conversation, for example, he would often write up several different times in his journals, first giving the bare facts, then the social background of the guests, then the political discussion of the evening. His work continues to be taken seriously to our day. We in Michigan and across the entire United States need to decide once again what we want. Do we want our citizens to become “accustomed to obey,” or do we want them—that is, ourselves—to gain and hold, through continued practice, the skills of self-government? Why cannot the state send in advisors rather than managers to struggling communities? It is what our country first attempts with governments overseas. Why should our own local governments be accorded less respect than foreign governments? It is no mere coincidence that de Toqueville saw the greatest danger to democracy in the "tyranny of the majority." Or is self-government just too much work? Are we not up to the standards of 1831 any more? "What's It Like Here in the Spring?" No one ever asks that, do they? It's winter they want to hear about, but my answer to both questions would be the same. "That depends on the year. We never know what to expect." Follow this link to see my photographs from Wednesday morning, April 20, 2011. It was a stunner, and we stayed home all day. Thanks to Bruce manning the counter at Dog Ears Books, the bookstore was open. This morning, my hero David got us out of the unplowed driveway without 4WD. What a guy! And now the sun is shining, the roofs are dripping, and all this snow will soon be only a memory. If we hadn't heard a weather forecast, I might have seen this patch of snow in a shady spot this morning as the last of the season. 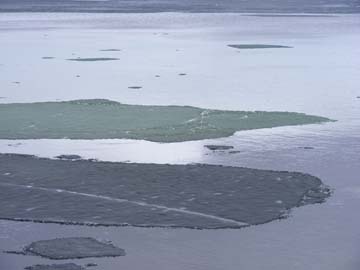 Look how tranquil the Bight looked, too. But it was the calm before the storm, we had snow in the air by late afternoon as the storm rolled in, and somehow this seems like a good time to look beyond the weather to see what's happening in the larger world of book publishing. One recent innovation in that world is the book “trailer.” You know movie trailers? (I am old-fashioned and still call them "previews.") Does the idea of doing not only visual but film-style publicity for a print book seem strange to you? Well, the trailers I've seen are quite innovative and interesting. Here, for instance, is one for the new Geraldine Brooks novel, Caleb’s Crossing. Take a look. I can’t remember if I posted a link to the trailer for Valerie Trueblood’s book of short stories, Marry or Burn, but whether or not I did it before, here it is now. I think you’ll be intrigued and impressed by both trailers, which is, of course, the point. Whets your appetite for the books, yes? Tell me a story! Next, this year’s Pulitzer prize winners have been announced, and the winning novel is A Visit From the Goon Squad, by Jennifer Egan. I have it in stock but haven’t read it yet. Have you? More discouraging news was a can of worms first opened by “Sixty Minutes” (though we're not blaming the messenger, mind you), a question about the authenticity of Greg Mortenson’s charitable venture detailed in the nonfiction bestseller Three Cups of Tea. Did the cause originate in the way he claims? More importantly, how well is the charity being managed today? As follow-up to this story, here’s a link with advice for how to choose what charities to support. There is a lot of need in the world, and when you give you want to know that your gift is doing what you intended it to do. It was a lousy way to act, but necessary. He was a turtle drawing into his shell. He knew it, and he knew it wasn't fair, but he had to do it. Turtles had shells for a reason. McAllaster was a kind of tribe. This wasn't cozy, or nice. She sensed that it was an equation, that membership would exact a price: the loss of privacy, anonymity, certain freedoms she'd taken for granted in Chicago, maybe the loss of the right to selfishness. I love living vicariously in the skins and days of these characters. The snail, when feeling threatened, retreats into its shell. When I feel the world is too much for me to bear (which usually translates into its being not enough of what I so much wish it were, namely, peaceful and nurturing for all its inhabitants), that’s when I need to get out of my shell--out of my ruts, out of my head, and out of my house. A dog on the rug in front of the fire is a comforting sight, but there’s nothing like getting outdoors with a dog to sweep a personal blue mood away. Of course, anyone claiming to be “not a dog person” will dismiss these opinions. I see before my mind’s eye now this not-a-dog person. He or she recoils with a shuddering, fastidious and contemptuous expression at the very idea, let alone the presence, of a dog. “Your dog doesn’t love you,” one such person took great pains to explain to me, hoping to purge my thinking of ignorant delusions. “The dog is just using you.” Well, if we’re going to be that cynical, we might as well think the same thing about human beings--that the baby “loves” parents only for needed protection; that parents “love” children so they can think of themselves as existing past the grave; that brothers and sisters “love” one another because there is safety in numbers; and that romantic “love” is nothing but a guarantee of sexual availability and a hedge against existential dread. It’s so easy to be a cynic—why stop with dogs? Not all not-a-dog people are cynics tout court, and I realize that many of them find joy in cats or birds or music or art or all of the foregoing. It’s just that, for some unfathomable reason, they draw the line at dogs. They begin sentences with, “The trouble with dogs is....” Well, you can find “trouble” anywhere, if that’s what you’re determined to find. I just don’t see why anyone would want to point out “trouble” in what is for me a source of joy. Cats are good, cats are beautiful, and I’m not out to find “the trouble with cats” or to heap scorn on tropical fish fanciers, either. If a pet snail can open up worlds, surely dogs are not the be-all and end-all of attachment to life. Oh, but my dog...! She does so much more than getting me out of my head. She gets me outdoors, and she keeps pace with me in my rambles, however long we're out, no matter how far far we go, and that’s what I need to escape cynicism and depression and irony—not a retreat into my shell but a companion to take me out of it, physically and emotionally as well as mentally. Born to run, my dog is most alive outdoors, and seeing her happy is such a great pleasure to me that I can't help being happy, too. But whenever I change direction, she turns and follows swiftly, and if I lie down in the grass and close my eyes, a few moments later I will feel her breath on my face. We can, as Kundera notes, sit and do nothing for long stretches of happy time, or we can hike and hike and hike until we come home exhausted. She’s up for it either way. 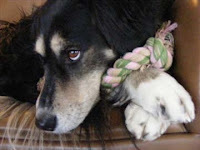 As long as there are dogs in the world, the species with whom ours co-evolved, who can despair of life? 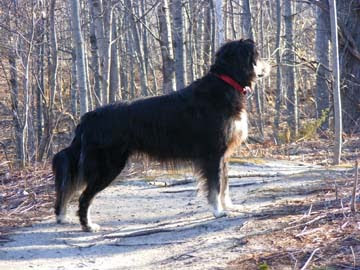 Whenever those messages of despair begin coming in too thickly, that’s when I need to get outdoors with my dog, my personal ode to joy. We are both alive, right now, with health and mobility to make the most of life. This won't last forever, for either one of us, and that's all the more reason to celebrate it now. I don’t much care for irony. There’s always disappointment involved, and sometimes outright betrayal. For example, the same season that has brought about so many grass-roots movements for freedom in the Middle East has seen elected officials in First World countries in the West dispensing with constitutions and overriding the established rule of law. It’s happening right here in Michigan, where the first onslaughts made possible by Michigan’s new law—the law trumping, apparently, our state constitution as well as local jurisdictions—have begun. I call that ironic. The little village of Northport has had its problems and struggles in recent years. Would we lose our local school? Was the new sewer project too expensive for village residents? Could one township employee hold down three government jobs at one time? What can we do to strengthen the economic base of our community? The conversations around these issues can be difficult, but Northport keeps having them, because this place sees itself as a self-governing community. I’ve always said, if you don’t like participatory democracy, you won’t like Northport. 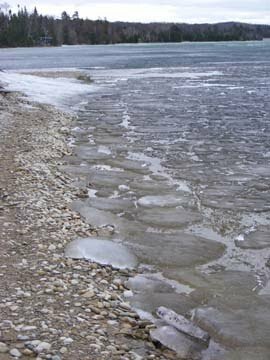 In fact, you won’t like Leelanau County, because no one here, I think, would be content simply to cast a vote for governor every couple of years and then go home and let the governor dictate the future for our village and township. But does everyone in Northport and throughout Leelanau County and the state of Michigan realize the possibilities inherent in Michigan’s new law? Where’s the value in voting if all you’re doing is choosing the next dictator? Has the evening of democracy come to the West? 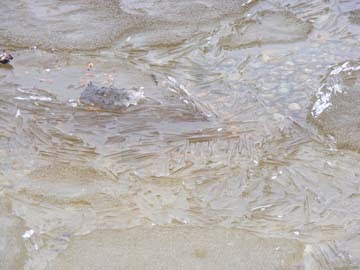 Will we cling to the forms and let go the substance? The first change is one you might not notice, but it happened over the winter. Bill and Nina Collins bought the old Grandma’s Trunk building, current home of the Pennington Collection (see below). Pennington is staying on, and the building has already received a few improvements under the new local owners. Here are Bill Collins and John Eggert (Sarah’s husband) gleefully removing the FOR SALE sign back in—what month was it? Ah, yes, the photo is dated February 4. Next, the Filling Station is open again! That’s happy news for all of us. 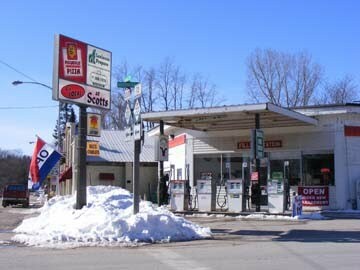 We're happy about the competitive gas prices offered by the new owners, Deep and Angela, too. Add to that that their two youngest children are readers, and I am pleased no end. Nice people, a welcome addition to the Northport community. Don’t let that snowpile scare you, by the way. This is another photo taken some weeks ago. Then there’s Bruce Viger, always on the lookout for a new project. He sold Eat Spot (new owner will re-open for summer there) and is now expanding the BBQ on Waukazoo Street, closing in the patio for indoor dining with new restaurant name and a liquor license. 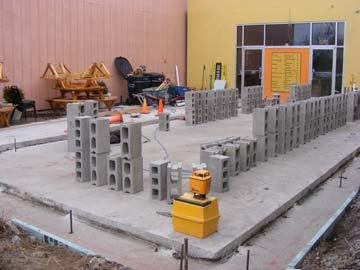 Right now it’s a construction zone, but come summer it will be ready to welcome you for dinner. This is the scene as of Thursday morning, April 14, 2011. Finally, the Northport Marina will be receiving a big facelift. I don’t have any pictures for that, as work has not yet begun, but since our marina is already the nicest and most convenient for miles around, you can expect to be pleased on this front, too. As for a dog park in the neighborhood, that's still in the initial talking stage. At Dog Ears Books, we are not planning any big changes, but currently we have a little sale going on. Hardcover mystery novels in the cart are three for ten dollars. 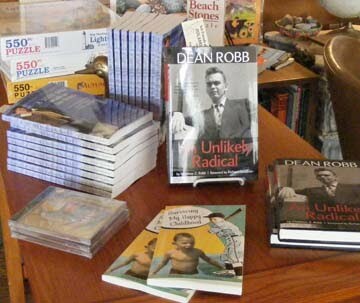 In the new book department, we have signed copies of A 1000-Mile Walk on the Beach and Dean Robb: An Unlikely Radical. You’ll also want to check out Jim Carpenter’s book of short stories, Surviving My Happy Childhood. The stories are fiction, and most are set in the college years. Sports lovers will especially enjoy several of these, including my favorite, “Tiger Baseball.” This book would make a great Father’s Day gift. Were those snow flurries in the air this morning? No matter, they’re gone now, vanished without a trace, and the sun has returned. I can’t believe it. This is my 900th post on “Books in Northport” since beginning the blog in 2007. How the years have flown! I’ve stayed pretty true to my vague and amorphous initial vision, writing about books and dogs, reading and writing, lakes and seasons and gardens and woods. A friend in Australia has noticed politics creeping in more lately, but I usually connect political topics to my reading. What to say on my 900th post? Who knows if I’ll last to 1,000? And assuming I do, who knows if I’ll note the milepost before it’s in my rearview mirror? (Milestones have a way of sneaking past me.) So now, while it's on my mind, I’m looking at my stats to see which have been the most popular posts, and since it often surprises me what pulls in readers, I'm going to share the top five with you, too. Starting then with #5 on the list, we have “When Do You Call It Censorship?” from November 12, 2010. This post was expanded from an e-mail I wrote that was published in Shelf Awareness, which may explain its popularity. It's also the most philosophical of the top five posts, the basic topic one I've taught in ethics classes over the years. Next one up, #4, is kind of a potluck, so it’s anyone’s guess why people were drawn to it. Were they doing a search for Grand Marais, or was the bait my mention of Mark Twain in the title? Gender? Garden seeds? Or was this scattershot approach itself the secret of this post's popularity? 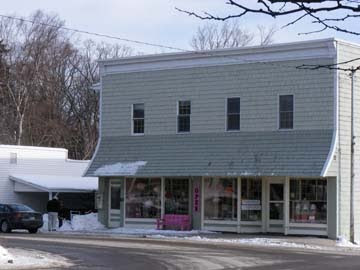 The post coming in at #3 position in the popularity polls for 2010-2011 is one of my favorites, too: “It’s So Northport! It’s the DOG PARADE!” No need to ask for a reason here! I'm just surprised this topic didn't make #1. Second prize goes to the second of three posts dealing with the novel The Help. The book itself is both popular and controversial, and a lot of people are probably still figuring out what to think of it. Still, this is the only post focused on a single book that got so much attention. Hmmm. I don't know what to think of that. And now, the envelope, please! The “Books in Northport” post from 2010 that brought in the most visitors, another rant picked up by Shelf Awareness, coming in at the #1 position is—are you ready?--“I Am Not a Luddite”! Was this your favorite? (Were any of these your favorites?) You see, there's no accounting for the public taste. Anyway, that’s my little story for the day. Not a big headline, and don’t ask me for the numbers, please. I would rather have you imagine them in the stratosphere. But if you missed any of these topics and want to know what all the shouting was about, just follow the links. As for me, I’m going to go rest on my laurels for a while. No, not really. There’s too much work to do in the yard now that spring is here. Errands took me down to the unincorporated village of Lake Leelanau and back home through Leland. 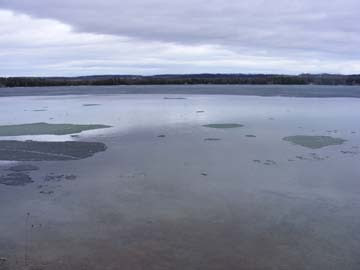 South Lake Leelanau was completely clear of ice for the first time this year. 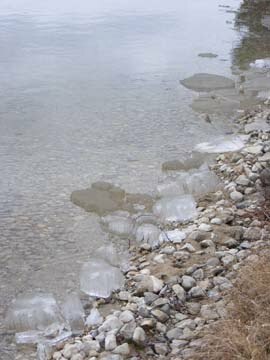 It was a cold day, very windy, hardly inviting one to linger on the lakeshore, but when I reached the north lake farther up M-22 and saw patches of lingering ice, I couldn't help thinking it might be the last day the lake would look at all like winter. Whimsical formations, looking like great, icy mushroom caps, stretched along the west shore. Inspired and curious, I decided to drive around and investigate the east side rather than going straight home. It looked completely different! 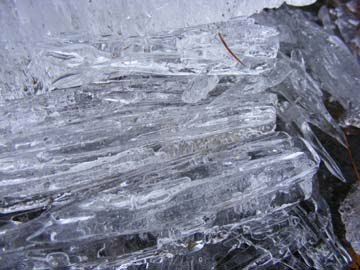 The blustery west wind had piled all the ice up on that side, some of it in pancakes, some of it in long, splintery crystals. 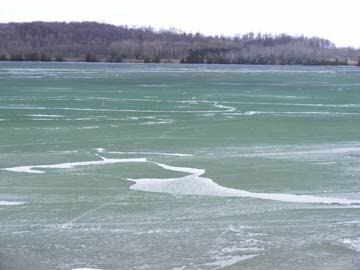 A little way south the ice out on the lake changed color to that punky, spongy green I always associate with spring coming in, while near shore were piled winter's last thick, broken sheets. We read and studied out of doors, preferring the sunlit woods to the house. 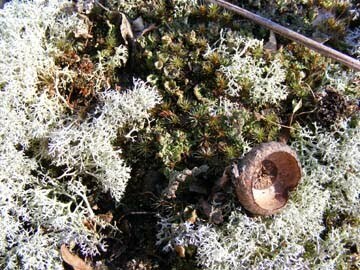 All my early lessons have in them the breath of the woods—the fine, resinous odour of pine needles, blended with the perfume of the wild grapes. Seated in the gracious shade of a wild tulip tree, I learned to think that everything has a lesson and a suggestion. ‘The loveliness of things has taught me all their use.’ Indeed, everything that could hum, or buzz, or sing, or bloom, had a part in my education—noisy-throated frogs, katydids and crickets held in my hand until, forgetting their embarrassment, they trilled their reedy note, little downy chickens and wildflowers, the dogwood blossoms, meadow-violets and budding fruit trees. 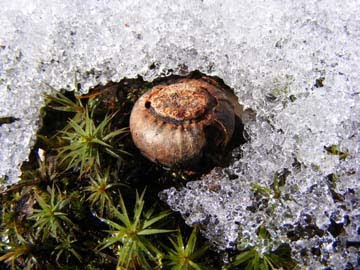 I felt the bursting cotton-bolls and fingered their soft fiber and fuzzy seeds; I felt the low soughing of the wind through the cornstalks, the silky rustling of the long leaves, and the indignant snort of my pony, as we caught him in the pasture and put the bit in his mouth—ah, me! How well I remember the spicy, clovery smell of his breath! The writer continues, describing feeling the angry buzzing of an insect caught in the petals of a rose she has plucked, the downy flesh of peaches fresh from the tree and apples, still sun-warm, held against her cheek. This happy child was Helen Keller, who lost both sight and hearing when little more than a year old. The Story of My Life, by Helen Keller, is a classic of autobiography. I am re-reading it for the first time in many years. There are a few episodes I recall, but many I read now as if for the first time, and my overwhelming impression of her life is that of great curiosity about the world and love for every living part of it. Keller was born in Alabama in the year 1880. The half-century referred to in my subject heading for the day is that of her last major public appearance, in April 1961, when she was named Humanitarian of the Year by the Lions International. (She was also the group’s first honorary female member.) That was 50 years ago this month. My outdoor expeditions generally focus on sights and sounds. Today, in honor of Helen Keller, I will give more attention to what I smell and to what my fingertips tell me of my surroundings, and Sarah is the perfect companion for a walk devoted to the world’s aromas, “seeing” so much more with her nose than I do with mine. I hope I give the world half as much love as Sarah gives it or as Helen Keller did. Its gifts, after all, are at my doorstep every day. I expected the pungent aroma of earth and the sharp scent of the wild leeks but hadn’t anticipated the delicate perfume of spring air in the corridor between orchard and woods or the subtle waves of temperature in that breeze, similar to warm and cool currents in a lake--and I can't show it to you! 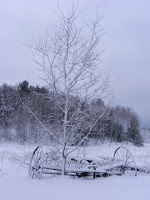 The smooth, chalky feel of birch bark I imagined ahead of time, picturing it in my mind’s eye. Outdoors, hand on a birch trunk, my fingers discovered, beside the smoothness, a very different texture in the soft curls of young, peeling bark. I did not feel ahead of time the shape of the lilac bud. It is not round but slightly flattened, like a lentil. What I noticed most of all, however, everywhere Sarah and I walked, was the ground beneath my feet. 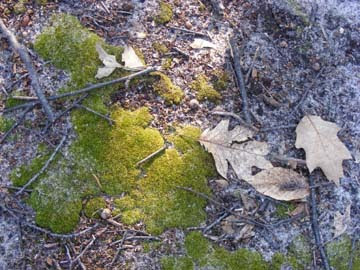 It was packed hard in some places, soft and loamy in others, scented with pine needles, richly covered with layers of last year’s leaves, unexpectedly rutted and uneven where a timber hauler had gone in before the winter freeze. All this would be surprising if I were unable to look ahead and see the changes before my steps brought me to them. 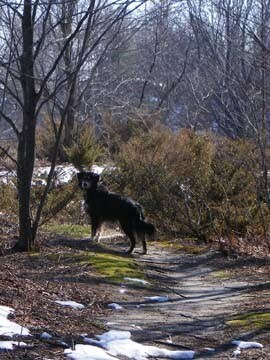 As it was, I failed to anticipate Sarah seeking out a patch of snow when she was hot and thirsty from running. Can you imagine how good that cool snow felt and tasted to her? I do not want the peace which passeth understanding. I want the understanding which bringeth peace. "Where Is the Car Ferry?" 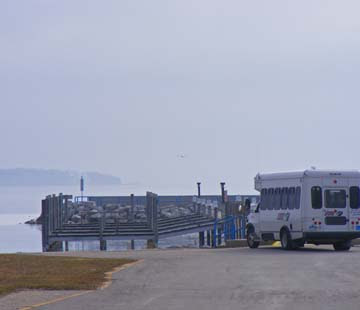 The driver of the BATA bus (Bay Area Transportation Authority) knows there isn’t a car ferry across Grand Traverse Bay from Northport to Eastport, so doubtless he was merely keeping to his schedule, using the few minutes between legs of his trip to enjoy muted morning light on the water. 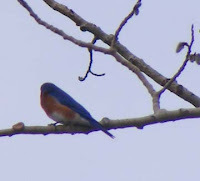 (It was an overcast after a bright dawn earlier.) But just imagine if there were a ferry. I like the sound of Northport to Eastport, but since Eastport doesn’t have a harbor or docks and Charlevoix is more of a boaters’ destination, how about Northport-Charlevoix? If you’re on the east end of my proposed route, you would probably call the route Charlevoix-Northport. I don’t care. The boat would run both ways. I’ve been talking about my ferry idea for years, and people laugh and think I’m joking. I’m not joking. Now, where are the investors with vision to make it happen? Madeline spent a long moment gazing at the town. She understood in a way she hadn’t before that if she drove down that hill, her life would change forever. Disclosure: Ellen Airgood is a friend of many years, and I love Michigan’s Upper Peninsula, the U.P., passionately. There, now that’s out of the way, and I can start to tell you about Ellen’s debut novel, South of Superior, slated for June 9 release by Riverhead Books, a Viking/Penguin imprint. 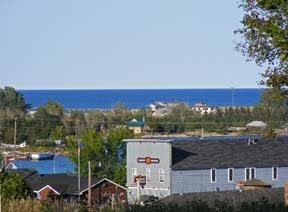 Okay, my disclosure wasn’t full, after all: Grand Marais is our home away from home, a place David and I dearly love. I admit it. But Madeline Stone isn’t Ellen Airgood, and the other characters in this book, like Madeline, come straight out of Ellen’s head, as near as I can make out. It's within the scope of the novel that they are real. Get it? They are not actual Yoopers given different names to disguise their identities but real in the sense that they come to life on the pages. That is the magic, the miracle, of good fiction. Unwed mother Randi Hopkins, for example, calls forth conflicting feelings of judgment and acceptance from those around her. Then there’s Paul, working a job on the side to keep his little pizza restaurant open. The harsh climate and hard work and community and private struggles are real. I felt right at home in McAllaster and not only because I know Grand Marais, the town on which McAllaster is modeled. Maybe I still haven’t disclosed enough, but how much do I want to put “out there” for the world to see? I don’t live in the U.P. 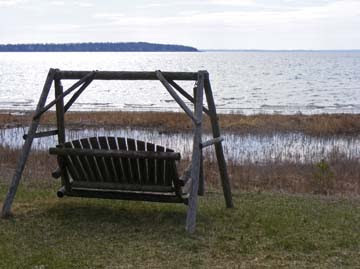 but in the northern lower peninsula, in a county that has become, like McAllaster, a haven for comfortable retirees and wealthy second (and third and fourth) homeowners, along with summer vacationers. Thirty years ago there was more room on the edge than there is today, but for people trying to make a living here it’s always been hard, as it is for the people in Airgood’s fictional McAllaster. I’m a bookseller in a small, struggling seasonal village, and my husband is an artist. The life Airgood describes is a life we know. We live it. McAllaster had never noticed the Great Depression, Arbutus had told her, because everyone was dirt poor and starved, only they didn’t know it. But it was different now. Some people had managed to make a little money, just enough for it to go to their heads. But no, this isn’t one of those simplistic stories where lines are drawn between Us and Them. One of the many things Madeline Stone learns as she gets to know the people of McAllaster is that individuals cannot be characterized according to how much money they have or how long they’ve lived in a place. The central characters in this novel (like their creator) know about hard work first-hand. They accept it and don’t wish for handouts or pie in the sky. What throws them is what throws all of us from time to time, the unexpected events, the things you can neither anticipate nor control. These people South of Superior are guarding their soft spots, too--the memories that make them vulnerable and the inevitable regrets and unfulfilled longings that haunt every human life. And yes, this very guarding often creates more problems than it solves. 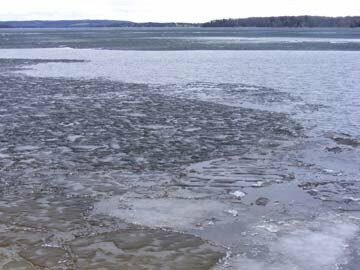 A snap decision or a failure to decide, a moment’s attention or inattention, an old photograph, a popular song, a casserole: life’s events turn on small details, in northern Michigan as in any corner of the world, and author Airgood knows that. There is real life in this novel. I love good regional fiction. Wait. No, I love fiction that pulls me into the place where the story is set, whether or not I know the place firsthand. Whether northern Michigan or Montana or Botswana or Siberia, New York or Paris or London or the coast of Italy—I want to be in the setting of the novel while I read, and that was certainly part of my great enjoyment of this particular novel. But the other, more important piece of living through reading is feeling that one is not only in a different place but inhabiting the characters’ lives, and the further I got into South of Superior the better I knew those people, from the inside as well as the outside. At the beginning we are thrown into Madeline’s life but don’t have much background with which to make sense of where we are. Gradually, as pieces of her past and present are revealed, we learn that there are huge gaps in Madeline’s own knowledge and that much of the story’s conflict is an internal struggle--to learn, to know, to accept and to forgive various people in her life, including herself. I’m happy about the way this book is being marketed. Since I started to say I love “regional fiction,” let me say now that for too long the North has been seen only as “regional,” while Eastern, Western and Southern fiction has been recognized, for some reason, as “American.” It’s time for the rest of the country to recognize that the North is as American as anywhere else. Up North people worry about jobs, they agonize over whether or not to start a business, they have family members overseas in the armed services, and they fret about fuel in winter and nonstop work in summer and about how to raise their kids and work together in their neighborhoods and towns and cities just like everyone else. 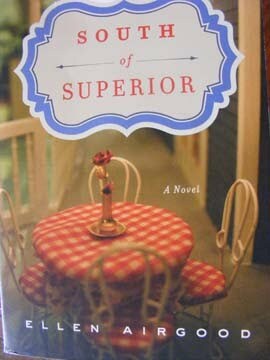 South of Superior is as much a novel for readers in south Florida or New South Wales as for those closer to home. As a bookseller, I'm joyously anticipating the chance to offer a novel that accurately and lovingly portrays, with all its shortcomings and struggles, a world I know to be true, a world where real people--ordinary people, if you will--live and quarrel and love and work and try their best to make something of their lives. I didn’t want this story to be over, and when it ended I wanted to start reading it all over again from the beginning. I am eager to introduce these new beloved fictional friends to my bookstore friends and customers when the book comes out in June. And now Ellen is coming to Northport! The date is Friday, June 17th, just a little over two months away. Mark your calendar now! Until then, you can visit Ellen’s website and follow her on her blog. Can you tell that all of this makes me very happy? Confined to bed by a mysterious illness and unable even to sit up, Bailey became fascinated by a small wild snail brought to her by a friend in a clay pot of woods violets. Observing the snail gave interest and focus to her interminable hours of solitary confinement and forced inactivity. In solitude very far removed from that of Bailey’s sickroom isolation, I was studying alone one evening during my first year of graduate school in a small, almost empty apartment in a strange city. The minimal furnishings of my monkish space consisted of a wobbly-legged dinette table, two wooden chairs, a low coffee table holding my typewriter (I sat cross-legged on the floor to type) and, in the bedroom, a futon on the floor and cardboard boxes, on their sides, open end out, holding books. I was lying on the carpeted living room floor when a tiny, bright red mite, smaller than the head of a pin, appeared on the page I was reading, moving purposefully across the lines of type. Had I pricked my finger with a needle to draw blood, the insect would have matched that blood in color. Another living being! I was so pleased! The next day, as usual, I walked to campus. When I told my fellow students about the mite, they all understood. Watching another creature go about its life . . . somehow gave me, the watcher, purpose too. If life mattered to the snail and the snail mattered to me, it meant something in life mattered, so I kept on. Along with a highly personal odyssey of immobility (if I may call it that), the author explores natural history and poetry, tracing what others have discovered and noted in the miraculous complexity of this one small, inconspicuous wild creature. The Sound of a Wild Snail Eating is a jewel of a book, destined to become a classic. Wild snails in my neighborhood would do well to continue their hibernation a bit longer, but I have chosen today’s images (photos taken Saturday afternoon) with snail scale in mind. Perhaps a note on today's heading is appropriate here, as well, although anyone who has spent time in theatre will recognize the allusion. In the world of stage and greasepaint, one is often reminded, "There are no small parts, only small actors." Never a star, I drew strength from those words. During my senior year at Tougaloo, my family hadn’t sent me one penny. I had only the small amount of money I had earned at Maple Hill [restaurant in New Orleans]. I couldn’t afford to eat at school or live in the dorms, so I had gotten permission to move off campus. I had to prove that I could finish school, even if I had to go hungry every day. I knew Raymond [her stepfather] and Miss Pearl [his mother] were just waiting to see me drop out. But something happened to me as I got more and more involved in the Movement. It no longer seemed important to prove anything. I had found something outside myself that gave meaning to my life. If you have read Kathryn Stockett's The Help (which I blogged about here and here) and wondered how the story would go if a black woman had written it, try Coming of Age in Mississippi. Anne Moody’s first paying job came when she was only nine years old. She was paid seventy-five cents a week and two gallons of milk to dust and sweep an old lady’s house. After seeing that the old lady let cats drink out of the milk cans, she didn’t want to drink the milk any more and told her mother why, but her mother wouldn’t believe her, and so the girl continued carrying milk home to her family. She planted and chopped cotton for a while and continued to do housework for white people all the way through high school, but she kept her distance from boys, determined not to be trapped in a life like her mother’s, dependent on a man and having one baby after another. She went to college on scholarship, paying her living expenses by working summers in a restaurant (moving up gradually from dishwasher to waitress) and in a chicken slaughterhouse as a strikebreaker. It was in college that Moody joined the NAACP, an organization so hated and feared by whites in her home of Wilkinson County that black people didn’t dare to say its name out loud, let alone join, lest they wind up murdered like Emmett Till. Soon afterward she became involved with SNCC, CORE, voter registration drives and civil rights sit-ins. Her life was threatened. Medgar Evers was killed on her 23rd birthday. The end of the book, like much of the story, may not be what you expect, but it is one black woman’s firsthand experience of growing up poor in rural Mississippi and trying to make life better for her people. 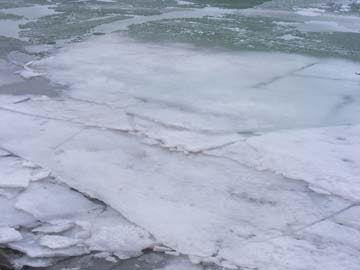 Yesterday I went for a short walk. Out of the sun it was actually pleasant--nice breeze, not too hot. After I figured out which pedestrian signal controller box I should use to get across the street, I waited for the green little-walking-man icon and step into the crosswalk. Hearing what sounded a lot like a small-car engine revving, I looked left and saw a little car--not red, for once--making a left turn against the signal, and bearing down on me. After honking, the driver put his hand up to the windshield, palm-out, in a STOP! gesture. Not wanting to get taken out at the shins, I stopped. Now, I had the signal in my favor. He should have yielded to a pedestrian in a crosswalk, anyway. Many American pedestrians, in my position, might have given the driver our national one-finger salute in response to his behavior. In the UAE, however, the person making the rude gesture could find himself in trouble, because the driver on the receiving end of the gesture would be entirely within his rights in going to the police and making a complaint. The offender might then be ticketed or given a ride downtown for a little talking-to. Something to bear in mind on your next visit. They have malls there, right? The Dubai Mall is bigger than the Detroit Metro airport. Of course it wouldn't be complete without a ski hill and a small luge run, now, would it? There’s also a small skating rink. It looked strange to me, with all the painted winter-theme walls air-conditioners mounted at ceiling height, and the people all bundled up like children in '50s-era photos, zipping downhill, or down luge run, or circling the rink. Most appeared to be adults, but there were kids, too. We had lunch in an Iranian restaurant, from which we could see parts of the ski hill, as well as a large LED display panel. The panel displayed shots of a store that (apparently) sells Ferrari-branded items, and other mall-related stuff--then all of a sudden it flashed the reminder, “DRESS APPROPRIATELY.” A while later it said “PRAYER TIME.” There was a guy in a U of M cap sitting a couple of tables away. Just another day at the Dubai Mall. Not the largest mall in Dubai, either. Okay, last night I was going through the channels on the TV in my room. The TV looks just like the ones in furniture stores, which are only plastic shells. Eight times out of ten, when I go to raise the volume it shoots me back to Channel 0, which is blank. Then I get to scroll through the channels again (the number buttons won't allow me to enter a channel directly), and what a panorama of channels it is! The Bollywood movie channel, of course--which I find myself watching for a few minutes at a time. They get RAI 1, the Italian TV channel, too, for some reason. And where else would you get to see a drag-racing show in Arabic, taped at the drag racing facility here? Apparently if you have the dirhams to burn, you can go there and drive an almost-really real drag racer. I’ll have to ask our correspondent to tell me something about food. We don’t watch TV at our house, and I’m not a mall shopper, but how and what people eat in different parts of the world always fascinates me—and usually makes my mouth water.